SOTA is an addicting contest-like activity for amateur radio operators who love the outdoors. Activators carry portable radio gear up to designated summits and "activate" the peak by making at least four contacts from within the activation zone. Chasers hunt the activators and claim credit for the summits after making contact with an activator. For more information, see the official SOTA Website. There are many tools available for researching summits and planning access routes. A favorite in the Pacific Northwest is Google Earth, which provides information about elevation, topology, roads and trails, etc. The SOTA Mapping Project provides maps and other excellent SOTA planning tools. 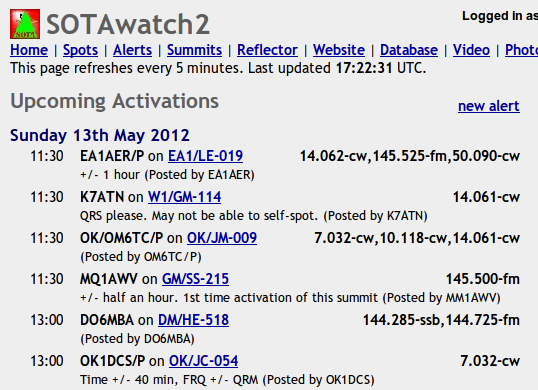 Many activators add information to the SOTAwatch summit database containing access details and links to other information about a summit. 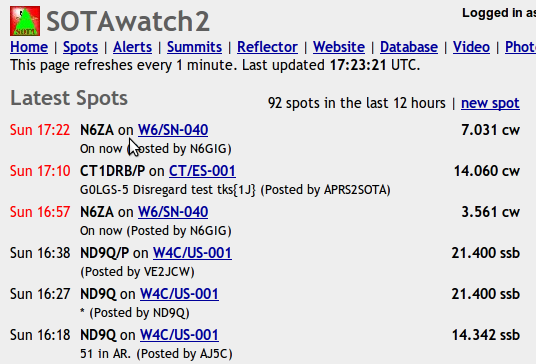 On the SOTAwatch page, click "summits" and search by name or summit ID. Various commercial software packages from Garmin and DeLorme also provide good data and tools for planning activations. If you have a GPS, you should also take a look at the NW Trails GPS maps. This site provides freely-downloadable trail and topographical map data for Garmin GPS devices. First, be sure to read N7UN's How to Activate a SOTA Peak. Next, be sure you have reviewed the appropriate ARM for the association in which the peak is defined. Usually the ARM will have some basic information about activation procedures and guidelines. It is a good idea to alert chasers to your plans ahead of time. Be sure to add an "alert" to the SOTAwatch Alerts list. This is a widely-viewed list of planned activations and will help chasers know when and where to expect you. Planning your approach and ascent is usually half the battle. Not all summits have well-defined trails to the top, and often a bit of orienteering is required for a successful trip. Use the tools provided above to plan your initial approach by vehicle and the path you plan to take on foot, keeping safety in mind at all times. A handheld GPS is a very helpful tool for an activator. Be sure to use a device that is intended to be used off-road. By entering in the coordinates of the trailhead, any significant trail junctions, and the summit itself ahead of time, navigating the trail can be much easier. Many of the more sophisticated devices have integrated topographical maps which may have information about trails, terrain, and other geographical features. Besides setting up your radio gear, one of the first things many operators like to do is spot themselves. If you have a smartphone and have data service at the summit, browsing directly to SOTAwatch and entering a spot for yourself is a very effective technique. There are also several apps that work very well for both posting and viewing spots. On iOS/iPhone try "SOTA Goat". On Android, try Rucksack Radio Tool or DroidSpot. If you don't have a smartphone, but do have a regular cell phone, there are multiple SMS gateways available which allow you to send a specially-formatted text message to a special phone number where a robot will post a spot for you on the list (info here). Finally, if you are activating a very remote spot, you may have a better chance of being heard by using an APRS device. One primary benefit is that potential chasers watch your ascent progress and estimate when you will arrive at the top. However, if you register on APRS2SOTA, you can use APRS messaging to submit spot reports over the APRS network, which is often much more accessible in remote areas. Operating from the summit is not unlike operating anywhere else. However, complications such as limited battery capacity and environmental considerations may require more attention. Further, safety hazards such as wind, rain, lightning, and daylight cannot be ignored due to on-air excitement. Be sure to keep all of these in mind when having fun on the summit. Most operators call CQ from the summit, giving the chasers an opportunity to find you and get their points. Be sure to consider the chasers when planning activities on the summit as they are a key part of the process and keeping them happy means that activators continue to be vigorously hunted! An important post-activation activity is results reporting. This involves submitting your contact log to the SOTA Database system. This system keeps track of all activation and chasing activities and calculates scores for the participants. It is important to submit your log so that your chasers (or activators) can confirm that contacts were made. It also provides a measurement of how much SOTA activity is going on in a particular area, which helps drive interest and increase participation. To submit your results, you must first have an account in the database. Once logged in, go to the Submit Log menu and choose either Submit Activator Entry or Submit Chaser Entry. The system will guide you through the process of entering your contacts. When you're done, be sure to explore the site a bit and enjoy the data and statistics provided by the system.